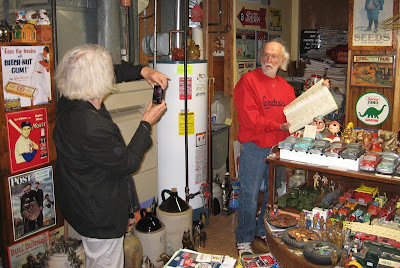 Joe, Elizabeth and Pat’s adventure continued with a visit to author, Jim Redwine, who literally wrote the book on collecting Banthrico Banks. “We also met with Jim Redwine at his home in Florissant, Mo. for several hours. He is an amazing character and a wonderful human being. He chatted a while - telling us his personal history and sharing significant stories about his collections. He brought is from room to room giving a great oversight to the many treasures held within. Then gave us all the run of the house to explore, look, photograph and enjoy his extensive collections. 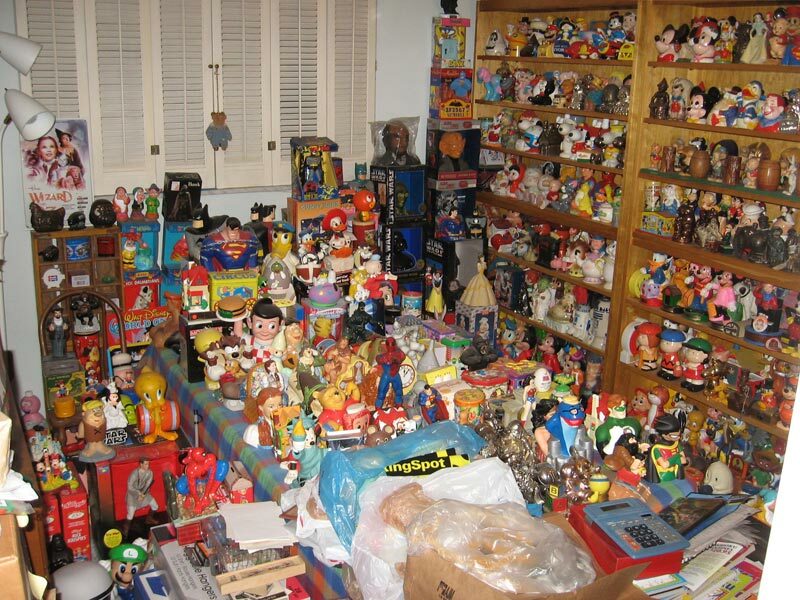 I have to make the point that when I say, collections – I mean he has many different types of collections. To me, he was always known for his still banks and souvenir building collections. And, of course – his extensive collection of Banthrico coin banks and other items. But those are just the tip of the preverbal iceberg. 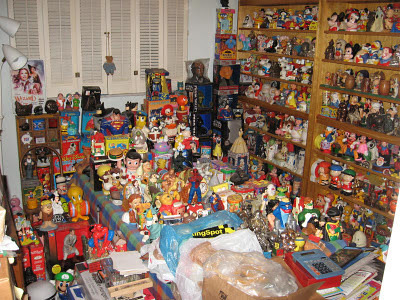 I can’t do justice to his extensive collections, but I’ll try to share some of them with you (in no particular order). In addition to the above collections, he also collects: door stops, cartoon character banks and related items, lunch boxes, Santa Claus items, tin can advertising banks, cast iron salesman samples of cook stoves (complete with miniature cookware, of course), Royal Dalton head mugs, bust banks, college mascot banks, car banks, cast iron toys, Indian head banks, ceramic “piggy” banks, glass bottle banks, cast iron mechanical banks, cast iron animals (banks & door-stops), clowns and bobble heads. 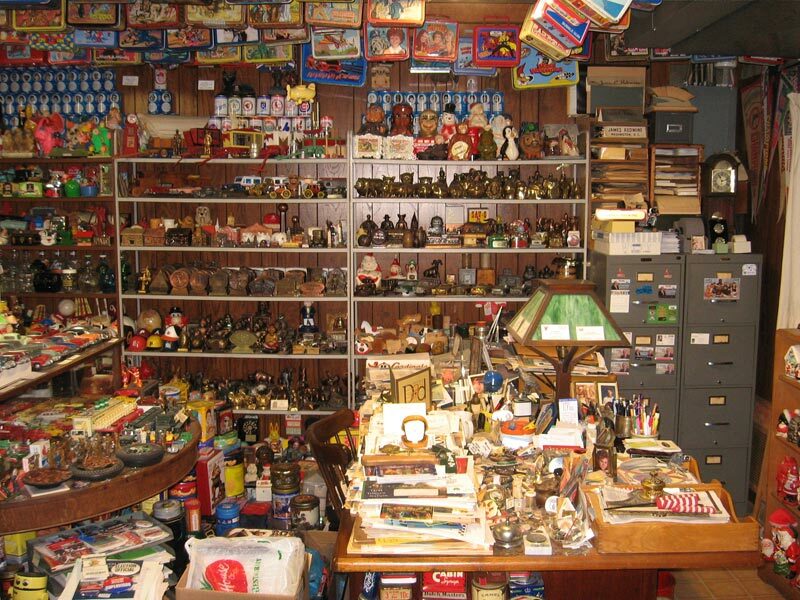 By his own account, he has over 6,000 items inside his home and another 1,000 duplicates in the garage. Each one of the categories I listed has such an impressive number of items that on their own would make any collector proud. Put together and it’s just overwhelming. Every collector’s “significant other” should witness Jim’s collection first hand. It really puts one’s own collection into prospective. I am speaking from experience. As you may know, Jim has written two books on Banthrico. At 81, he’s still going strong. He's about to write another book about cartoon character banks. I brought his first book with me so he could autograph it (which he did with pleasure). I had also bought his second book that night - and he autographed that one as well. He is am amazing guy. He does not have or use a computer. His entire collection (remember - over 6,000 items in his house and over 1,000 duplicates in his garage) is catalogued by hand and listed in his bound ledger books. He has a tiny dot with a number on the bottom of each item and can find out everything about it from these ledger books in a matter of seconds. He was put to this test when Pat Smith wanted to buy a Banthrico corn-cob coin bank from Iowa from Jim. He looked it up and sold it to her for the price he paid for it (so he says). The whole transaction was less than a minute. Above is a photo of a guest bedroom...can you find the bed?